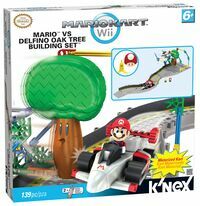 A Delfino Oak Tree is part of the "Mario vs. Delfino Oak Tree" K'NEX building set. Using a mechanism adjoined to it, the tree can be pushed onto the racetrack to block racers. Delfino Oak Trees are a species of trees. Though their name suggests a connection to Isle Delfino, they are not endemic to it. 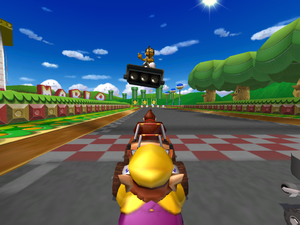 They first appear within the Mario Kart: Double Dash!! iteration of Mario Circuit, which returns in Mario Kart Wii as a retro course (this course also contains Princess Peach's Castle, which is in the Mushroom Kingdom and nowhere near Isle Delfino). The majority of them appear on the outskirts of the course, watching the race, but a couple of them appear on the racetrack itself. If a racer bumps into them, they immediately come to a stop. All of them gently bob and sway while remaining firmly planted. Delfino Oak Trees can also be seen in the background of the Mario Circuit stage from Super Smash Bros. Brawl, which reappears in Super Smash Bros. for Wii U and Super Smash Bros. Ultimate, again flanking the racetrack. ↑ Hodgson, David S. J. Mario Kart Wii Premiere Edition. Page 144. This page was last edited on December 16, 2018, at 22:50.